China’s digital advertising market will reach over US$ 50 billion this year, and Chinese tech giant Baidu is poised to be one of its biggest beneficiaries. 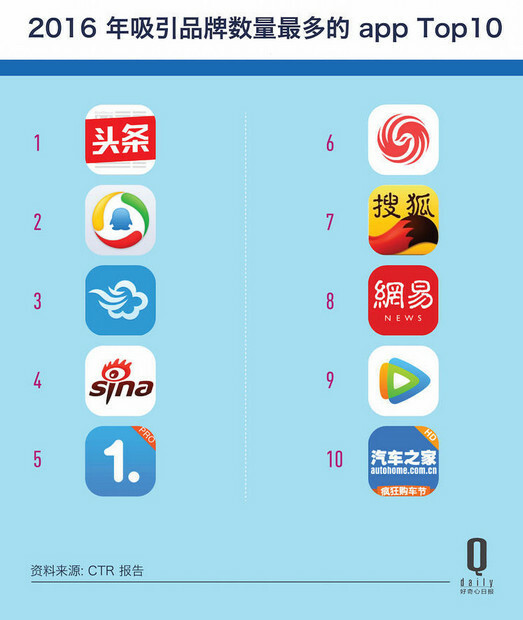 But according to an analysis (in Chinese) from Chinese media QDaily, in the future, the company may surrender its position to a newer contender, such as Chinese news aggregator app Jinri Toutiao (今日头条). Toutiao’s impressive revenue growth backs up this claim. In 2014, the company reported RMB 300 million of revenue, while in 2015, that number reached RMB 1.5 billion. 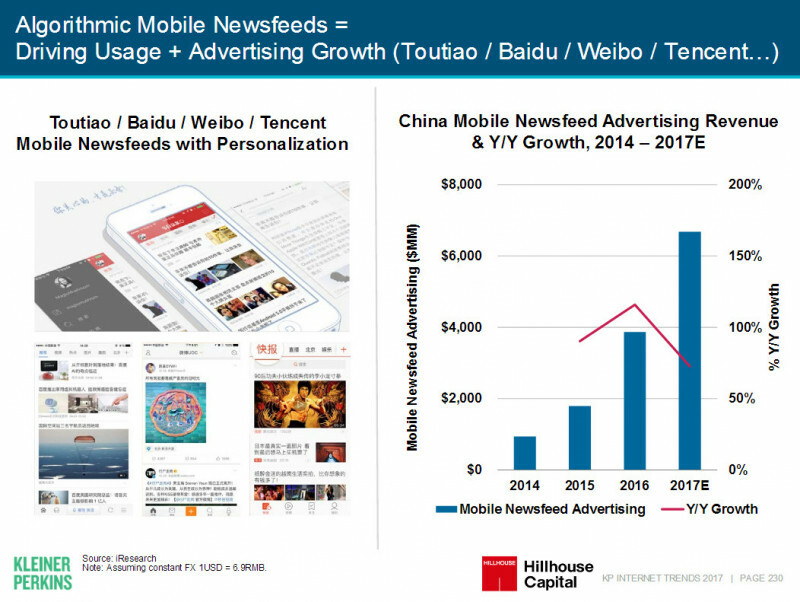 Last year, Toutiao reported RMB 6 billion of revenues from in-feed ads. This year, the company’s founder and CEO Zhang Yiming has set the target at RMB 15 billion. This growth rate is similar to what Baidu experienced in 2011 during the golden age of PC when it reported RMB 14.5 billion of profits and established itself as a true Internet giant. Last year, however, Baidu earned RMB 64.5 billion from ads which was only 0.8% higher than the previous year. In Q3 of 2016, Baidu’s advertising business was down 6.7%. Behind Baidu’s faltering revenues and Toutiao’s success are structural changes in digital advertising, particularly the rise of in-feed advertising – one of Toutiao’s biggest strengths. The app uses artificial intelligence to personalize news content and ads for its users. However, the reason behind Baidu’s diminishing revenues is not just the form of the ads – it is the advertisers themselves. The type of advertisers who are willing to spend money on digital marketing has changed. As InMobi Greater China Vice President Wang Wenqi explained, it is really a transition from performance-based advertising to brand advertisement. Baidu’s main source of revenue has been small and medium enterprises, especially from the medical industry that advertise themselves through search ads. The company’s advertising model took a big hit in April last year when it was discovered that a young cancer patient died after seeking out medical treatment in a facility advertised by Baidu’s search engine. The scandal sent its Q2 2016 profit down by 34.1% comparing to the previous year (in Chinese). Since then, the Chinese government has introduced restrictions on medical and health products ads. On the other hand, Toutiao has been working with big brands which have recently been pouring more money into mobile marketing. The well-established model of search ads used to have priority in digital advertising budgets because it was based on intention to buy something. Brands, however, advertise themselves without knowing the consumer’s intention, so they focus on their interests or catching their attention. This works well with in-feed ads where information is spread out through news feeds and social platforms such as WeChat, reflecting global trends in digital marketing. Other analysts, such as Zhang Luoyang claim that Toutiao’s position is not as firm as it seems despite its current valuation of US$ 11 billion after its latest Series D funding round led by Sequoia Capital. According to Zhang, RMB 6 billion of revenue with a user base of 600 million means that the company’s profit margin is quite low. Toutiao will need to further develop its business models in order to catch up with the likes of Baidu. Baidu is also not giving up. At the end of 2016, the company launched its own in-feed ads and it is currently developing personalized news services. The rest of China’s technology giants – Alibaba and Tencent – have joined the movement with UC Toutiao (UC头·条) and Kuaibao (快报), along with independent content aggregation apps such as Yidian Zixun (一点资讯). Toutiao has responded to the challenge by allowing not only media outlets, but also businesses, organizations, and individuals to publish their own content. This has brought Toutiao’s model closer to Tencent’s WeChat which is now the company’s biggest competitor. WeChat, in turn, is currently invading both Toutiao’s and Baidu’s business models with its newest functions Take a Search and Take a Look. The first one curates and recommends content based on user preferences much like Toutiao, while Take a Look is a search engine. The new development means that WeChat will be able to profit from both types of ad formats.